After twenty years around the world, a tiny village, we wonder if one day someone drew its relief on a map. Its name is France, as the big country, as to get us lost in its palimpsest and scramble the slight hope of investigation. There, they cultivate the feeling of a child hiding his toys in his bed, waiting for the dreams. There, there is the whole world who knows to halt. My childhood’s home did not have fence in the garden, it was the mysterious infinity of the woods and the mist of my reminders … The phone calls to the firemen when the pine forest went up in flames, asleep along the lake, the twilight waking and the fear of wild boar, the stag’s roar and the night roar among the woods. A horse’s body steaming, the winter, trees’s reflection in the water holes whose the roots warp as Polynesian knife’s zig-zag. Look at the bird sent me back to my human being smallness, my impossibility of wings. this is a limited happiness, it opens tu us the necessity of imaginary. It was a matter to speak to our inner child, the one living deep inside each of us. We opened the page, it was already here, this snowy landscape, so we decided to invent it. We transport the way, assemble it and disassemble it, in those woods, labyrinth from the edge of the world. Even in winter I hold my hand out to receive a just dead leaf, the dry and enclosed seeds will deliver the treasure of there resonance as a rebirth. To see with new eyes, to stop ridiculous carnival of our anxiety and to make up with our insignifiance. this is an extraordinary gift « spread ephemeral to infinity » and walk with the imperceptible crowd. There is compassion, a look. We are not asking much more than that, a look, in order to prevent ourselves to meet others. This is the same thing with the world, to give ourselves the opportunity to imagine belonging to the same family. To stop a moment in order to observe and to be submerged by the world’s beauty while stopping to dominate it, this is to find its place. Tonight they let the fireworks freezing in the sky, I don’t know what they will say. Syrians in a rowboat, everything is broken, we’ve ran away to feed our children. In our story they’ve sunk to death in the waves but survived n some other worlds, that way, even persecutors can reach paradise. And yet, there are here, this nice Syrian family, as my little boy running and screaming « daddy ». Him who his the fruit of the love of the exodus which at the arrival of the Nazis had pushed his grandparents in the arms of each other. Nature is looking at us, and the fox opens its arms. 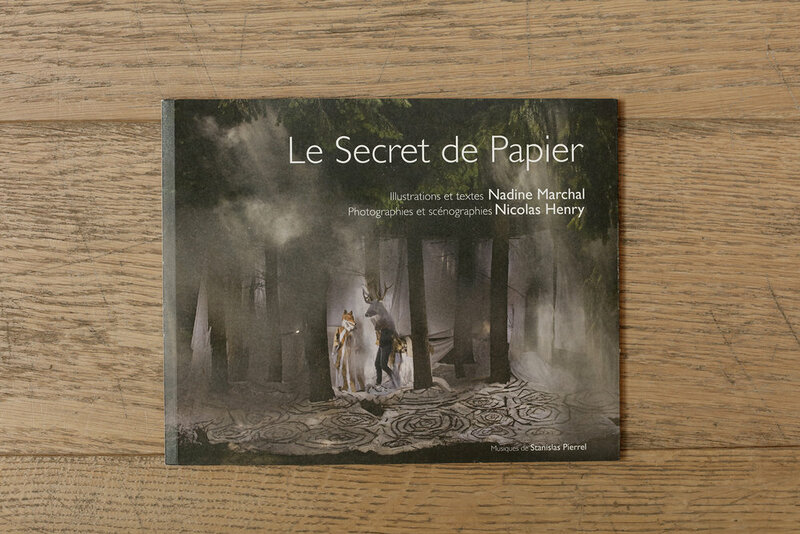 « Le Secret de Papier » is a tribute to creativity, dream, love and to let go. The blank page was my generous guide all along this creation. This is important to me to share its secret, the one which opens all the ways of dreaming and imaginary. In the paths of this quest, wonderful souls helped me. I wished to mention Nicolas Henry who said « yes » to this project. He occupied this fantasy universe with style, talent, sincerity and humanity. He has resurrected through its photographs the Motherland, its landscapes, its animals and its spirit. This book belongs to the blank page, to the tree, to the land. You will hear the beats of its heart while listening the music. « Le Secret de Papier » is passed by orality. It sings, it tells. That’s why you’ll find page after page, this little drawing inviting you to listen the songs appearing on the digital part attached to the book. Other marvellous human being have assisted me to the birth of this creation, the musicians : note, rhythm ans melody’s magicians who are making souls dancing. Among them, Stanislas Pierre, my husband, has composed and « sculpted » musics around worlds and pictures. There is Philippe Pipon, a person filled by percussions, a person who has bound « Le Secret de Papier » to the land thanks to his vibrations. There is Manuel Rangel who has known how to fix the sacred with his maracas and his huge talent. He has composed « Secreto de Papel » under our home wisdom’s tree. « Le Secret de Papier » is waiting for you.